We changed the schedule up so the kids only have one nap a day. This has been tough to keep them occupied with minimal meltdowns for the longer wake time stretches but a 3 hour nap is well worth it! I really don't even know how to fill all of that time yet! 2. Time Outs Are Working! Grandma and Grandpa Glass came to visit last week and let us parents have a weekend away in San Antonio. Oh, how nice to enjoy some time away, if only to appreciate all that we truly miss when it's not right in front of us. Plus, my dad has some work to do in Houston and is staying through the end of this week. It surely is nice to have some extra hands around here - especially when changing up the schedule, thank you, Dad! 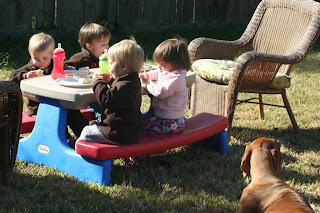 Picnics in the Backyard = No Cleanup, Yippee! The second broken pot of the week and no one was hurt! that's awesome, mare! LOOOOVE to hear it! What a great end to my break! 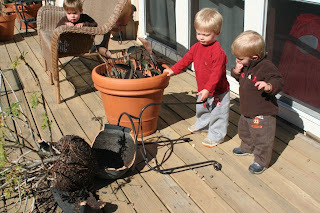 I just have to laugh at the expressions on the boys' faces as they innocently stare at the pot. Love to all. Oh Girl...you have been my saving grace on more than one occasion...you MUST email me that schedule! Mine go down great for their morning nap, but 9 times out of 10 they don't take their afternoon nap which leads to miserably tired and fussy babies at about 7 pm! LOVE, LOVE, LOVE the outdoor picnic...what a great idea. You are so awesome! Great post. I read it yesterday and came back today for another read. Notice how the boys are the ones standing by the broken pot...hmmmm? Isn't that the greatest little picnic table...Ans wants to eat every meal at hers!! Love the Valentine background and you!! Thankfully no one was hurt, but that's a great picture. I love it. For the next post, they'll all be pointing fingers at each other. LOL. Glad you enjoyed your weekend away.